Our latest training initiative is the BCP Programme which is delivered in conjunction with leading liquids manufacturers. The course includes practical and classroom based training and covers everything from health and safety to roof design and project planning. Successful candidates receive a specially created red ‘Experienced Worker’ CSCS card that is valid for three years. This then allows them plenty of time to go on and obtain the NVQ that they will need in order to qualify for blue ‘Skilled Worker’ CSCS card. Our bespoke, grant supported SUP courses are designed to deliver the appropriate skills necessary for experienced operatives in the roofing sector. The programme requires reduced time offsite and features various topics such as roof structures, types and terminology, as well as training on various liquid waterproofing chemistries available in the industry. Following training on the course, each candidate will be assessed on site at NVQ Level 2 to complete the Specialist Upskilling Programme. The fully grant aided SAP course has been developed for future roofing applicators of any age. It covers all aspects of roofing with a particular emphasis on liquid applications and also includes relevant health and safety issues, basic first aid, scaffold safety and asbestos awareness. 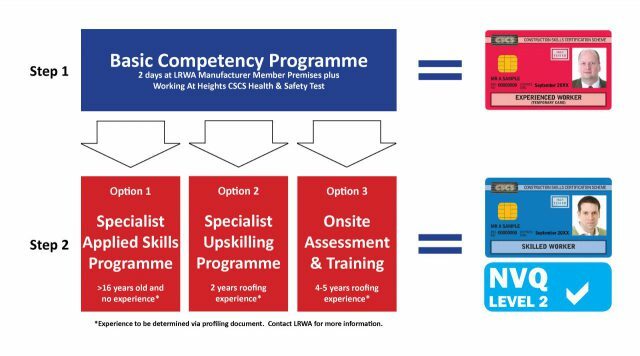 On completion of the Specialist Applied Skills Programme, each candidate will achieve an NVQ Level 2 qualification, which will enable them to obtain a blue CSCS card. The OSAT course is specially designed for experienced roofing contractors who have no formal qualification, and is a simple, fast and effective route to obtaining a relevant NVQ diploma. With no courses to attend, assessment and any training are carried out on-site, meaning that there is minimal disruption to everyday work activities. Once the NVQ2 has been obtained, workers can apply for the blue CSCS ‘Skilled Worker’ card.